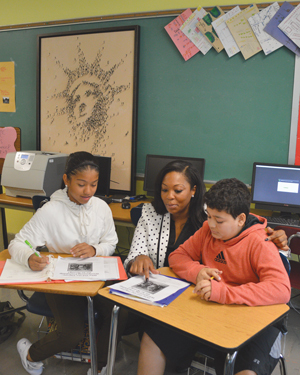 April Francis, NCSS member and social studies teacher, guides two of her students at Lawrence Road Middle School in Hempstead, New York (2015). A world in which all students are educated and inspired for lifelong inquiry and informed civic action. Founded in 1921, National Council for the Social Studies is the largest professional association in the country devoted solely to social studies education. NCSS engages and supports educators in strengthening and advocating social studies. With members in all the 50 states, the District of Columbia, and 35 countries, NCSS serves as an umbrella organization for elementary, secondary, and college teachers of history, civics, geography, economics, political science, sociology, psychology, anthropology, and law-related education. The NCSS membership represents K-12 classroom teachers, college and university faculty members, curriculum designers and specialists, social studies supervisors, and leaders in the various disciplines that constitute the social studies. Membership in National Council for the Social Studies is open to any person or institution interested in the social studies. Social studies is the integrated study of the social sciences and humanities to promote civic competence. Within the school program, social studies provides coordinated, systematic study drawing upon such disciplines as anthropology, archaeology, economics, geography, history, law, philosophy, political science, psychology, religion, and sociology, as well as appropriate content from the humanities, mathematics, and natural sciences. The primary purpose of social studies is to help young people develop the ability to make informed and reasoned decisions for the public good as citizens of a culturally diverse, democratic society in an interdependent world. In essence, social studies promotes knowledge of and involvement in civic affairs. And because civic issues—such as health care, crime, and foreign policy—are multidisciplinary in nature, understanding these issues and developing resolutions to them require multidisciplinary education. These characteristics are the key defining aspects of social studies. Published in 2010, the NCSS National Curriculum Standards consists of ten themes incorporating fields of study that correspond with one or more relevant disciplines. Published in 2013 and the result of a three year state-led collaborative effort, the C3 Framework was developed to serve two audiences: for states to upgrade their state social studies standards and for practitioners — local school districts, schools, teachers and curriculum writers — to strengthen their social studies programs. Its objectives are to: a) enhance the rigor of the social studies disciplines; b) build critical thinking, problem solving, and participatory skills to become engaged citizens; and c) align academic programs to the Common Core State Standards for English Language Arts and Literacy in History/Social Studies. The C3 Framework is designed to guide states in their efforts to upgrade their social studies standards and to inform the pedagogical approaches of social studies educators across the nation. Revised in 2017 and effective January 1, 2018, The National Standards for the Preparation of Social Studies Teachers outline the social studies content, pedagogical knowledge, skills, and dispositions needed in order to prepare ambitious social studies teachers. This document consists of two sections: (1) an introduction, which contains, in addition to this overview, information about the background and contexts in which the standards were developed, a description of the audiences to which the standards are addressed, and the general framework that guided the construction of the standards; and (2) the standards themselves with a supporting rationale. The standards were designed for the review of teacher education programs. NCSS also encourages their use by teachers and administrators to support high-quality social studies instruction and professional development. Frequently, NCSS is invited to participate with other organizations in a variety of projects, programs, and services. NCSS reviews requests for involvement each month. For more information on collaborating with NCSS, please contact Dr. Lawrence Paska, Executive Director, at lpaska@ncss.org.